Please read all details of the Footcred® 30-Day Returns Policy below before making your return. We can accept returns or exchanges for all articles purchased from us provided that we receive your return request within 30 days of your original purchase date. To be accepted for return or exchange, your articles must be in the same original purchase condition as you received the product. This includes the condition of the product itself as well as all product packaging, marketing materials, instructions and/or documentation. All product packaging and included materials must not be defaced or destroyed in any way. Articles returned to us in used, worn, damaged, or otherwise non-resalable condition; articles returned to us with defaced or missing packaging may make your return unacceptable. Please do not tape product packaging/boxes shut or tape labels directly onto product packaging, as this will be considered defacing the product packaging. Returns that do not meet our acceptable criteria may be returned to you without refund, or be subject to a damaged item fee. Please allow 10 working days from the time you ship your return to allow for us to receive and process your return/exchange. If we have any questions regarding your request during the return process, we will contact you using the information provided in your email. Upon receipt of your return articles, we will issue a refund to the original payment method for the price of the returned item(s), after all received discounts, minus a flat £1.25 processing fee for each returned item. Note: This processing fee is waived on all exchanges. If your original order benefited from Free Shipping and you choose to return that order, please be aware that we will deduct the cost of an second class postage and packaging from your refund. However, if you make only a partial return of your order and the portion you keep would still qualify for free shipping, we will not deduct any shipment fees from your refund. If you paid for shipping when you placed your order, we will not deduct any additional shipping fees; however, your original shipping cost will not be refunded. If your order was a Super Multi-Pack or Mega Multi-Pack and you make a partial return of your order, if the portion of your order that you keep no longer qualifies for the original promotion, any discounts no longer applicable will be deducted from your refund. If you are exchanging a returned item for an item of lower cost, we will refund the price difference to the payment method used on the original order. If you are exchanging a returned item for an item of higher cost, we will contact you for payment information for the price difference. If the item for which you wish to exchange is out of stock when we receive your request, we will contact you for information on how you would like to proceed. If an item you receive is damaged or defective when you receive it, we will be glad to issue you a replacement of the same product at no cost to you. Please contact us at info@footcred.com to get started with this process and have your replacement item mailed to you. Please do not mail your defective item back to us before contacting our Customer Service team. Outside of the products that we manufacture ourselves, as an authorized and trusted dealer of each of the brands we carry, Footcred® is glad to honour all manufacturer warranties and satisfaction guarantees. 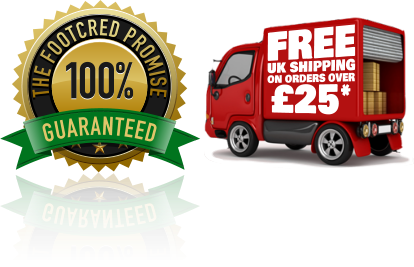 If the product you are wanting to return is covered by a manufacturer warranty or satisfaction guarantee, we will honour all the terms and conditions of that guarantee even if the product does not meet the criteria of our standard return policy. If you are returning a product under manufacturer warranty or satisfaction guarantee, please be sure that your return meets all of the criteria to be eligible for warranty coverage based on the manufacturer’s warranty/guarantee information, which may be found on the product packaging and/or included documentation. Please follow all return instructions provided by the manufacturer when making your return. Many manufacturers will instruct you to submit your warrantee/guarantee claim directly to the manufacturer, not to Footcred® . Please be aware that not all products are covered by a manufacturer warranty or satisfaction guarantee. We can only accept “satisfaction guarantee” returns on products for which the manufacturer offers such a guarantee. All items purchased from us marked Clearance or other “closing” promotion are done so on an “All Sales Final” basis and are not eligible for return or exchange. If an such item is delivered in damaged or defective condition, we will replace the item if possible, or issue a full refund if a replacement is not possible. However, we will still honour all manufacturer warranties and satisfaction guarantees on clearance articles.